From the jandbeyond.org (#jab13) came the call to introduce our finest biscuits / cookies / stroopwafels. Best would be something we have a special relation to. 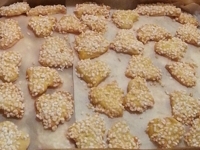 For me these were the “Sauresahnekringel” from aunt Lisa. Actually she was not my real aunt, but for little boys that does not really count ... and in my memories she is still my Aunt (and I had many aunts at that village). She was very old, her face was wrinkled as dried apple, age and the hard work at the fields had bent her back, so she could not stand straight anymore. She was always kind and full of cheer and made everyone feel at home. Now I think that it might have to do with the fact that she loved to cook and share her fantastic food with the people around her. Certainly she won our hearts by her spirit.